Use the link below to download this Spanish grammar exercise in pdf. The present tense in Spanish is not very difficult to learn, but there are some verbs that have particularities that make their conjugation a bit odd. These verbs have an irregular present tense in Spanish, and you have to know them in order to be able to detect them and use their present tense correctly. There are plenty of verbs that have an irregular present tense in Spanish, and we can study them in groups. In this post we are going to study the verbs that have an -o- in their root that turns into -ue- in the first person singular, the second person singular, the third person singular, and the third person plural. The endings for this verbs are the same as they would be for regular verbs. 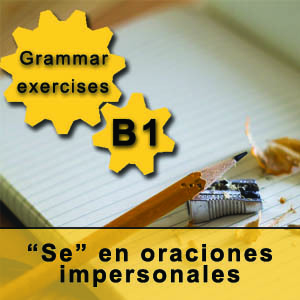 This kind of irregular present tense in Spanish appears regardless of the conjugation. That is, it appears in verbs that end in -ar, in -er, and in -ir. Pay attention to the ending, for the endings of the verb depend on that. In the link above you can download this grammar exercise, which includes other verbs with this irregularity. 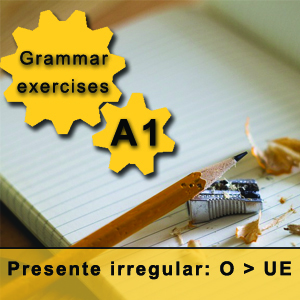 The exercise has been extracted from our Spanish grammar book, which explains the Spanish grammar through visual and practical schemes. 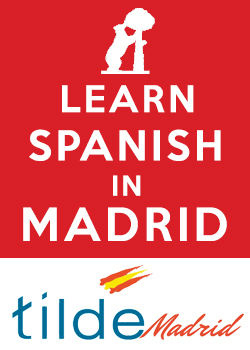 And, if you want to go deeper in the study of the Spanish language, and you want to learn Spanish with experienced native teachers, feel free to visit our Madrid Spanish school.